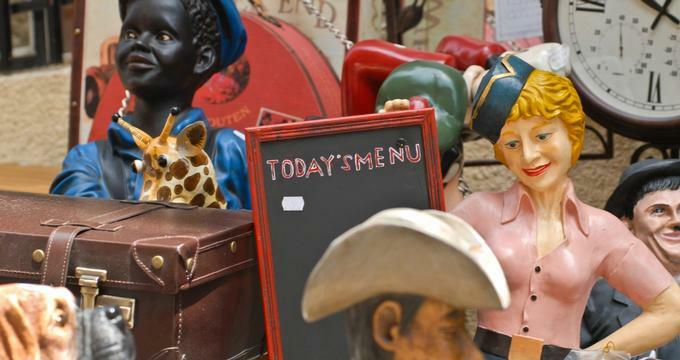 Located in Madrid, Spain, El Rastro de Madrid, commonly known as El Rastro, is the country’s most popular weekly open-air flea market, offering a wide variety of new and used goods from its vendors, including clothing, household items, and antiques. The word rastro, which means “trail,” is thought to have originally referred to the trail of blood left behind by cattle sent to the slaughterhouse for wholesale meat purchase. By the beginning of the 16th century, the Villa de Madrid neighborhood that is now the site of the El Rastro market had begun to be referred to as El Barrio del Rastro due to its concentration of slaughterhouses, including the Matadero Viejo, the first municipal slaughterhouse in the city, which opened around 1497. A number of tanneries also moved into the neighborhood due to its numerous streams running downhill toward the Manzanares River, and a large number of ropavejeros, or common goods peddlers, began to frequent the area due to its high commercial activity. By the mid-17th century, businesses such as shoe factories, clothing stores, and candle shops had begun to populate the neighborhood, but in the late 18th century, all tanneries were ordered to evacuate the area to avoid river water contamination. Following the closing of the neighborhood’s tanneries, the neighborhood began to operate on a split commercial schedule, with slaughterhouses operating throughout the week and vendor goods stations set up on Sunday mornings to sell a wide variety of clothing, jewelry, home items, and other goods. In 1984, the Madrid City Council confined the weekly market area to a specific section of the neighborhood, and in the 1990s, vendor selling throughout the week not operated as part of the Sunday market was banned at the request of the neighborhood’s store merchants. Up to 3,500 stalls are offered at the market weekly, which is regulated by the Madrid City Council. Due to its international fame as one of the world’s leading open-air market districts, the market receives more than 100,000 weekly visitors, including a high number of tourists. First-time visitors to the market are recommended to attend around 11:00am, when the concentration of shoppers and vendors is at its highest, though visitors wishing to haggle with vendors are advised to arrive earlier in the morning. The market is known as for its tolerant, multicultural atmosphere, with sales vendors including native Madrid citizens, immigrants, and travelers of all ethnicities. Vendors from Portugal, Maghreb, Central Africa, France, Pakistan, India, and South America are common, with many selling international goods and observing traditional ethnic customs. Certain streets within the neighborhood are associated with the selling of certain kinds of goods, including Calle Fray Ceferino Gonzales, also referred to as "Calle de los Pájaros," or “the street of the birds,” for its selling of domestic animals and pet goods. Calle San Cayetano has become known as “the street of the painters” for its high concentration of stalls selling paintings, drawings, and art supplies. Clothing and accessories are concentrated on the Plaza de Cascorro, while Calle Carnero and Calle Carlos Arniches are noted for vendors selling rare and collectible books. Multimedia items and movie memorabilia are common on Calle Mira el Sol, while collectibles such as magazines, stamps, and trading cards are found on Calle Rodas, Plaza de Campillo del Mundo Nuevo, and the Plaza de General Vara del Rey. The market is accessible from several Madrid Metro stations, including Line 3 at the Embajadores station, Line 5 at the La Latina station, and Lines 1 and 2 at the Sol station. Empresa Municipal de Transportes de Madrid buses transport visitors to the district on market days, and the city’s Cercanías Renfe commuter train network stops nearby at its Line C5 Embajadores stop. Following the market’s midday peak, many visitors stop at nearby restaurants and bars in the La Plaza de Cascorro area for drinks and tapas.